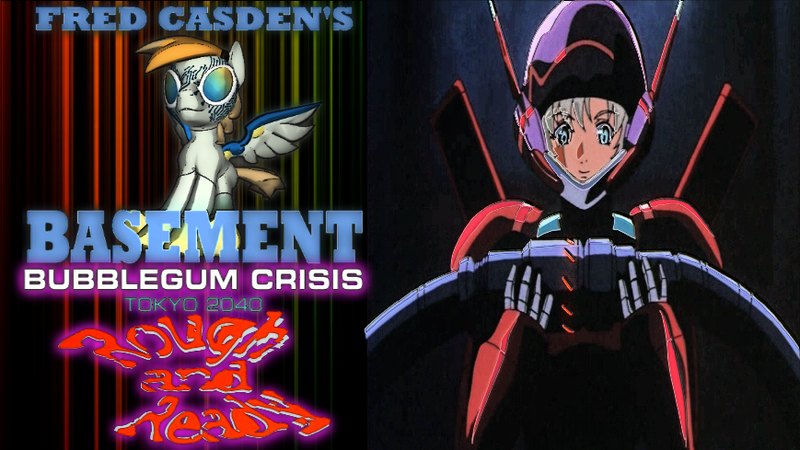 It's Friday, August 25, 2017... and for this week's Talking Anime segment, I'm going over episode five of Bubblegum Crisis: Tokyo 2040, which is titled Rough and Ready! Title reference to album by Jeff Beck? AD Police to the Rouge Factory Boomer first, Knight Sabers late because Pris was late, and if it fused with the factory machinery it would really be bad. First Mission where Priss, Linna and NeNe all suit-up together. NeNe disables cameras and reverse the power, to allow for Priss and Linna to hit the Boomer hard and heavy. With Nene and Priss distracting it and Linna smashing the core. Turns out Mason arranged for the boomer to go rouge, shutting it down to replace it's core... and it's all a trap for the Knight Sabers. There is a flash back to when Tokyo was devastated and how Boomers helped return things to normal, as well when Sylia learned that her father went missing, also that her father was making a bio-construct and that her mother had doubts about it, and that his experiments caused a split, and that her mother died, and Sylia was used in his research and that invented the boomers.These memories distracted Sylia in the modern day.